You may think of the Web as a big tubular mesh of interconnectedness, but really, apps and sites tend to be more like islands than Kumbaya-singing cooperative circles. Evernote doesn't seamlessly save your notes to Dropbox. The Facebook photos you're tagged in don't automatically post to your Flickr account. Articles you save in Feedly don't push themselves to Pocket for later reading. The secret sauce is foretold in the name: IFTTT is short for "If this, then that," and the core building blocks of the service are based around that simple, cause-and-effect relationship. A trigger event happens, and a resulting action occurs. One example of a potential recipe: If you like a photo on Instagram, then IFTTT automatically saves that photo to the Dropbox folder of your choosing. You get the idea. Before you start dabbling in recipes, however, you'll have to head over to IFTTT.com to create an account and connect some channels to that account. A small taste of the many IFTTT channels available. "Channel" is IFTTT parlance for a Web service or other action. 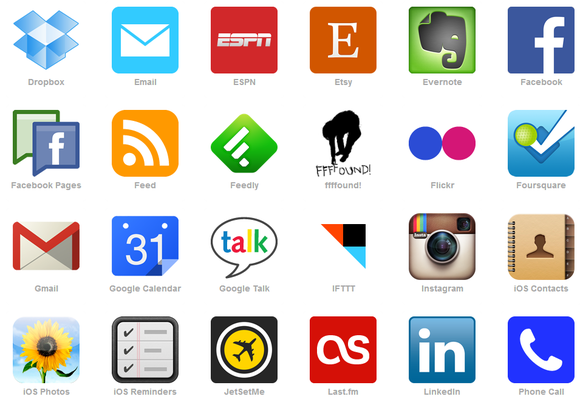 IFTTT currently supports 67 different channels spanning a wide range of popular services, and it can perform basic actions such as calling or texting a phone, or sending you an email. Once you've gone through and activated some channels—basically, granting IFTTT access to your various services or providing it with personal details—you're ready to start crafting. Let the mad science begin! 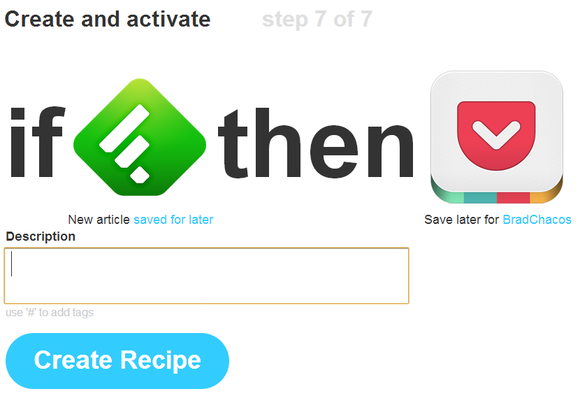 Open the My Recipes tab at the top of the IFTTT website and click the big blue "Create a Recipe" button to start. You'll see the text above appear onscreen; click the "this" link as prompted. The process is pretty straightforward, and IFTTT does a good job of walking you through it. We'll use a simple example as we go along. Select a channel to serve as the "Trigger"—a chosen service that kicks off the cause in your cause-and-effect IFTTT recipe. (If you choose a channel that you haven't activated, you'll be prompted now to do so.) For this example, I'll use Feedly, the awesome Google Reader alternative. Next, you'll be presented with a list of specific trigger events available for the channel. 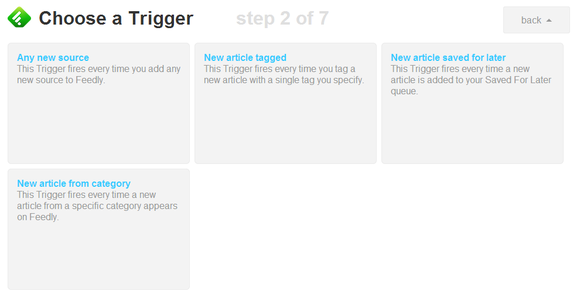 Trigger events are the actions that set the IFTTT recipe into motion. For example, with Feedly I chose "New article saved for later." Whenever I save an article in Feedly (the cause), the rest of this recipe will occur (the effect). 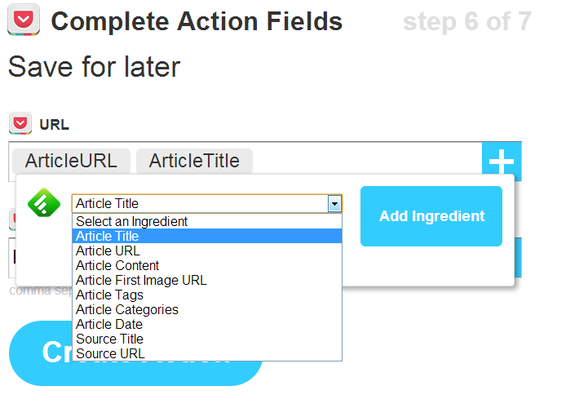 The third step lets you add specific trigger fields. These fields let you narrow trigger events down to very specific occurrences, such as using the Feed channel to monitor a single RSS feed. 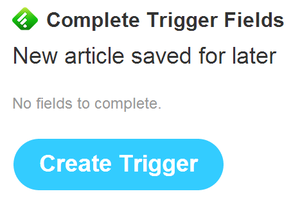 Once you've set that up (or not, in the case of a trigger-field-less event such as the Feedly example), click the big "Create Trigger" button. Now, you have to set up what happens when a trigger event is tripped. So I saved an article in Feedly—now what? Click on the blue "that" link to continue. As with the trigger, your first step toward setting up a subsequent action is choosing a channel. In this example, I'll pick Pocket, a.k.a. The Service Formerly Known As Read It Later. With Pocket, your Action choices are about as limited as limited can be, but other services offer much more varied Action options. For example, Dropbox (shown above) can save files to the folders of your choosing or create a new text file when trigger events fire. IFTTT's Facebook Action options include the creation of new status messages, link sharing, or even photo uploads from predetermined locations. 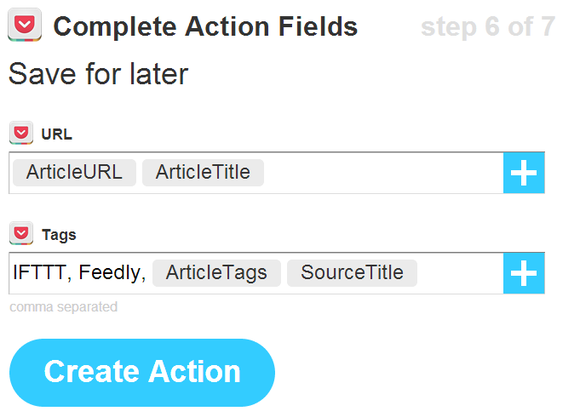 Finally, we've reached the Action Fields screen, where you can fine-tune the outcome of your recipe (if the channel supports it), tweaking the aforementioned folder paths and file URLs and whatnot. IFTTT is pretty smart: The default setting is usually a sound one. I've decided that any articles I save in Feedly should appear in Pocket with their URL and headline, and I want to list those articles with some predetermined tags for easy sorting. On the final screen, you'll have a chance to go over your handiwork. Don't forget to add a description! You won't be able to see the trigger/action notes when you're glancing at your main Recipes page—only the icons for the services and the description you've written. And with that, the IFTTT recipe is complete. In my case, any article I save to Feedly is now automatically pushed to Pocket for later reading, with no manual muss or fuss on my end. IFTTT does all the heavy work behind the scenes, checking for new trigger events every 15 minutes. The Feedly example may be simplistic, but with a little imagination and some concurrently running recipes, IFTTT can become insanely powerful. Don't take my word for it: Let's take a peek at some of the more interesting recipes IFTTT users have shared. Better yet, let's try some out—jump to the next page.